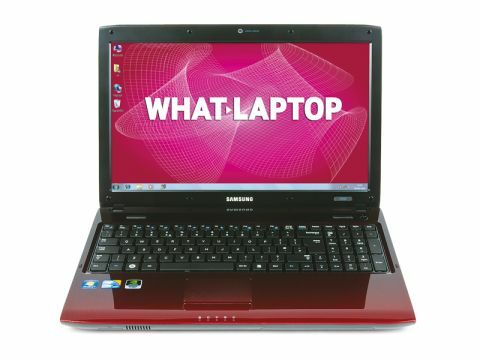 Samsung is well known for its excellent range of consumer laptops, as it frequently offers the latest technology and stylish designs at truly affordable prices. The R580 is an entrylevel media centre and impresses with its powerful performance and features. As with the Dell Inspiron 1546, Intel's latest Core i3 technology is used to deliver stunning levels of power at this price. Combined with 4096MB of high-speed DDR3 memory, performance is outstanding and even the most demanding applications run with ease. Graphics power similarly excels. Powered by a dedicated Nvidia GPU, 3D performance is good enough for some modern games. Mid-level gaming is possible, as is frequent photo and video editing and an HDMI port lets you connect to an HDTV if a larger picture is required. You're unlikely to need it, however, as the 15.6-inch LED screen provides striking images. Despite its glossy Super-TFT coating, reflections are kept to a minimum. Colour and contrast are strong, with deep black levels on offer, but brightness is a little lower than we would have liked. While the chassis is slightly too large for frequent travel use, it weighs a surprisingly light 2.5kg. Combined with the great 207-minute battery life, you can comfortably work around the home. In terms of design, the R580 takes cues from past Samsung laptops, but adds a new layer of style. The glossy plastic chassis uses a graduated black/red colour scheme alongside a patterned finish to good effect, although the shiny surface is easily smudged and scratched. An isolated-style keyboard has been used and works flawlessly with all keys well-spaced and with a reassuringly firm action. Thanks to the large chassis, a full numeric keypad is also in place. Specifications also impress. The capacious 500GB hard drive offers ample storage and 802.11n Wi-Fi and Gigabit Ethernet deliver high-speed network connectivity. An eSATA port provides fast connections to compatible external hard drives. Of particular note is the inclusion of sleep-and-charge technology on one of the R580's four USB ports. It allows you to connect any USB-compatible external device – such as an MP3 player or smartphone – and charge the battery even when the laptop itself is switched off. Offering impressive power and usability, the R580 is yet another great addition to the Samsung range. Its combination of high-speed network connectivity, powerful graphics and impressive array of ports nudge it ever so slightly ahead of the Dell Inspiron 1546, making it a great choice for a laptop.